Kuo-Chin Huang obtained his M.D. degree and PhD of Epidemiology from National Taiwan University (NTU), and received his post-doc training at Human Nutrition Unit of School of Molecular Bioscience in University of Sydney. He is the professor and director in Department of Family Medicine, College of Medicine in NTU. He is also the director and attending physician of Department of Family Medicine at NTU hospital. Over recent years, Professor Huang has been invited to devote his effort in the research of geriatric nutrition as the co-investigator at Division of Gerontology Research, National Health Research Institutes in Taiwan. His major research interest has mostly focused on human nutrition, obesity and its related diseases. He has published more than 100 papers from his work. 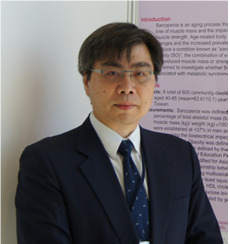 Professor Huang is currently the president of Taiwan Medical Association for the Study of Obesity, President of Taiwan Medical Association of Human Nutrition, President of Taiwan Association for International Health, Editor in Chief of Obesity Research and Clinical Practice (official journal of the Asia-Oceania Association for the Study of Obesity, AOASO), and Editor in Chief of Taiwan Geriatrics & Gerontology (official journal of Taiwan Geriatrics & Gerontology). He is the immediate-past president of Asia-Oceanic Association for the Study of Obesity and immediate-past vice-president of International Association for the Study of Obesity.